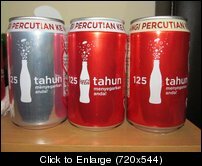 Hi all, I would like to trade this Coca Cola 125 years can (A set of 3, include regular coke, coke light & vanilla coke). Anyone intrested can PM me or email me. Thanks!